The Emergency Police Unit of the Wausau Police Department was formed in 1951 by then Chief Of Police Everett Gleason. When there was a need for crowd control, for a parade or a convention in the City of Wausau other police agencies from the area sent staffing to Wausau to assist. While a student at the FBI Academy, Gleason learned that some Police Departments formed Auxiliary Police Units using military veterans. Chief Gleason contacted Arthur E. Dornstreich, who was involved with the V.F.W., to see if Wausau could form an auxiliary police unit. Dornstreich recruited 17 members and the Wausau Emergency Police Unit was formally started on May 10, 1951. Arthur E. Dornstreich started out as a Lieutenant in the Unit and became the Director in 1974. The Unit has continued over the years, always with volunteers from various communities, who are willing to give of their time in such an effort. All of the parades, various 5k & 10k races, the Balloon Rally & Glow, the Wisconsin Valley Fair, The Festival of the Arts, Art in the Park, and other events are worked as needed. The Unit is also ready for any Emergency; such as storms or floods, where the police may need additional staffing for scene security and crowd control. Wausau Emergency Police have training throughout the year and work hard to be ready. The current director is Larry W. Jaeger and his executive officer is Major Frank Schuelke. The police liaison is Lieutenant Dwayne J. Dachel. There are two squads and about 35 Officers. As in any volunteer organization, we are always looking for new recruits. A candidate must be at least 18 years of age, pass a background check and an interview to become a member. Our members range in age from 18 to 70 plus, both male and female. The unit provides the uniform, except pants and shoes. Meetings are generally held on a monthly basis. 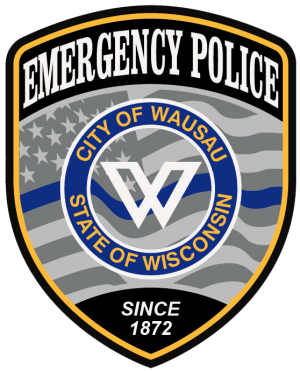 To learn more about the Wausau Emergency Police Unit, call Lieutenant Jillian Kurtzhals at 715-261-7988. Applications can be picked up at the Wausau Police Department during regular business hours or printed from this site.